Classic Trials have started up again after the enforced break. I havent done any events myself yet, but I hope you enjoy Ian Davis piece on The Exmoor Clouds. The Exeter will see the return of most of us, thats assuming we get out cars ready in time. Isnt amazing, how we did nothing to them while they couldnt be used! I won't be competing myself as my entry never reached Mary Margetts and by the time I made the discovery it was too late! I won't be missing out on the fun though, Mike Hayward and I will be going down anyway. I have been thinking about the Selby Rail Crash, where it is said that Gary Hart went to sleep at the wheel. It looks as if he will be sent to prison. I can't help wondering if we triallers sail close to the wind on this one sometimes. On the Exeter I always struggle to stay awake on the way from breakfast to the first hill and on the long grind down the A30 to Bluehills on The Lands End. Personally I always take the day off before an MCC event and put my head down before setting off for the start. I know some people take wakey, wakey pills. Has anyone tried Red Bull? The endurance element is a key part of MCC trials and without it they would be loose all their character but we must be careful, especially with the speed of modern traffic. I used to drive home after the Edinburgh until the day I went to sleep on the Motorway. I remember I was dreaming about somebody knocking on my bedroom door trying to wake me up. I did and it was the sound of my wheels on the Cats Eyes. After that I stay in Buxton overnight! The Gill Morrell Trial saw Falcons 2001 season draw to a close with an excellent event at Brickhill. I had planned to take part in my Nova but it wasnt ready on time so I spent the day marshalling with Steve Boakes. I hadnt seen him for a while so we had a great time chatting while I took some pictures and he marshalled the hill! My only reservation about Brickhill is that its a bit rough for genuine shopping cars so it was a shame that Kensworth had to be called off. I think we need a genuine "entry level" venue where you can go home with your spoiler and under-side intact! 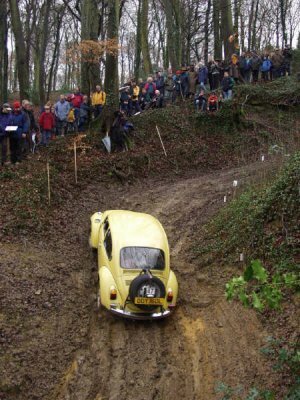 Autotesting provides that of course and perhaps so does 12 car rallying. With the SODs dormant The Watling Motor Sport Club can provide you with more opportunities to give your shopping car some exercise. Check out their website at www.watlingmsc.freeserve.co.uk  Jamie, Owen and friends have given Falcon some good support recently and I am sure they would love to see you. It was good to get the Exeter regs through the post. I think we are all feeling pretty deprived with no Classic Trials. The Ebworth and Exmoor Clouds are going to run but The Allen and The Hardy are both off. Like many people I havent touched my trials car during the summer so lets hope it goes when the time comes. Thats assuming I get an entry of course as I didnt get mine in the post until Wednesday morning. Going back to The Exeter its really great to see the MCC are running Class 0. Hopefully this will be a great success and could be the ideal way for Falcons who have heard how rough Classic Trials are to dip their toes in the water. I know it will attract a lot of older machinery but it should also be possible to use some of the less suitable modern vehicles without having to raise the suspension so the car is on stilts. It seems it could be the Exeter in January 2002 when most of us get back to Classic Trialling. Organisers are justifiably reluctant to approach farmers for permission to cross their land when Foot and Mouth still threatens. The rights of way in Bedfordshire and Hertfordshire all reopened at the end of July, which meant I could get in a bit of Mountain Biking while there was still some summer remaining. The other week I did a forty miler, including all the sections around Whitwell that we use on the March Hare. They looked pretty tough as the recent rain had sent a lot of water rushing down the hills, washing all the mud away and leaving a surface of loose stones. Lets hope that Falcon can run the March Hare next year. As a keen Falcon it was great to see the club back in competitive action again at Upper Caldecote on Sunday. There was a super entry, a nice blend of old and new, novice and experienced, applying to both cars and drivers! Interesting that Simon Robson set FTD in his first autotest driving his Liege, which is far from an ideal car. Its a sport where driving skill is far more important than the car. Personally I didnt agree with the committees decision on what it regards as Autotest specials. OK they can still take part but its not much fun if you cant go for FTD. In the old days of Autocross I think they had a 5% penalty which imho is a better idea. Neil B has a Skamp in his collection now and I would love to see him and Roger Dudley battling it out, they might even beat a certain Mr Robson! Time continues to be a problem here in the Classical Gas Garage. Things are changing in the day job. My little bit of the big muti-national company I have been with for nearly 30 years is being sold off and its down to me to sort out the UK bit. The Beetle still sits in the garage and perhaps this will be the first year since I have had it that it wont be stripped down in the summer. It looks as if there will be no Edinburgh and perhaps very few Classic trails this year. The problem is the long lead times in organising the route which has to be submitted six months in advance. I have a backlog of articles in my head so hopefully I will still be able to produce your favourite column even if there are no events to write about! Just seen the MCC Newsletter. It's great news about the Class ). I am sure that a lot of people will be prepared to bring out their P&J's. Of the people I know it would be nice for Neil Bray to trial Primrose again and Peter Mountain his Morgan. Then it would be super to see Kevin Barnes Singer and perhaps it could even awake Mike Furse's Mercury Special! I'm not so sure I like the proposed new format for the Lands End. This is the last long distance reliability trial and shortening the route and dropping the night sections isn't good news as far as I am concerned. Time seems to be my great enemy these days. Do you remember those far off days when your day at work seemed to drag? These days it seems that no sooner have I had breakfast than its seven in the evening, Im tired out through working so hard and have done nothing! They say thats what happens when you get old!. The day job is a bit demanding these days but looking around I suppose Im lucky to have one! With the F&M this should have been a summer with plenty of time to re-build the Beetle but the way things are going it may be the first one for ten years that it doesnt get touched. Computers have been occupying a lot of time at home. 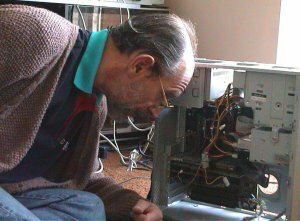 I have treated the machine in the dinning room to a new hard disk. Its sort of working now but boy was it a tough three days! Well it was a very strange Easter staying at home in Bedfordshire rather than going on the Lands End. At least the lawn got done! It doesnt look like we will be doing any Classic Trials this side of the summer and perhaps not even then. Our much loved politicians have been telling us "the countryside is open for business" but it hasnt been. I use this tense because only this week I see the local woodlands near us has big "OPEN" signs on it. This is great because at least it means I will have somewhere to go mountain biking. 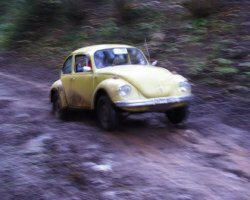 It seems that the MSA (I still keep wanting to call them the RAC) will start issuing permits for off-road events that are not on farmland so perhaps there is hope for the Falcon Autotest series. It seems so long ago! Michael's card being marked as he spins to a stop on Simm's greasy slab. The Foot and Mouth is really biting into Motorsport now, with the MSA cancelling permits for most off-road events. Its a strange situation though. You can be fined �5,000 for walking along a footpath that crosses a Golf Course yet you can play a round of Golf on it as its on private land! It certainly does seem a funny old world as some things are affected and some arent. I went on a corporate Off-Roading day on private land the other day, all perfectly legal, but our autotest series is under threat even though its in Neil Brays back garden! I wonder what will happen if its still with us at the British Grand Prix when most of the surrounding farms get used for camping and un-official car parks? Its going to be very strange not being in Cornwall this Easter! Its been a really busy couple of months for me and Ive either been working or trialling every week-end since Christmas. The ride with Dudley was fixed up by Murray MacDonald who called to say hed arranged a special treat for my Birthday! As you will gather from my report it really was a fantastic day and all being well I will bounce for Dudley again on the Kyrle. I have just heard that The March Hare has had to be cancelled because of the Foot and Mouth. Like the rest of you I feel desperately sorry for the organisers that this has happened after all their hard work. It really was a shame as we had a very good entry lined-up. It really has been a tough period for organisers with our Edlesborough event and the MACs Clee Hills having to be cancelled as well because of the weather. I understand Brickhill went well, despite the mist and we have The Lands End and the Autotest series to look forward to. Its been a tough couple of weeks for organisers. The Exeter turned out to be a great trial for those with well prepared cars with a couple of great new sections during the early hours of the morning when it was still dark for most competitors. However, the weather had wreaked havoc on Tillerton, Slippery Sam and Higher Gabwell, the water rushing down the slope had washed huge gullies between the rocks making them very rough. It does of course emphasise the ever increasing gap between the standards of cars and competitors as these sections were a nightmare for newcomers. The Exeter will certainly have helped the MCCs financial budget as quite a few triple aspirants lost their clean sheets on Simms. At least The Exeter ran. Simon Woodall and his team must have been devastated when they saw all that snow and they had to cancel their event. We most hope for good weather for the remainder of our early season trials. I hope everyone had a great Christmas. I am having a busy one. 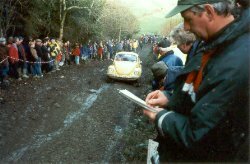 It's less than a week to the Exeter and I haven't finished the work to the Beetle yet! As well as fixing the damage that occurred on the Allen when one of the back brakes broke up I am raising the back a bit. As you Beetle types know this is not the most pleasant job! 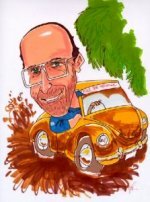 Talking of Beetles I hear a rumour that none other than ACTC Chairman David Alderson will be driving a Wolfsberg Wonder on The Exeter. This is the ex Graham Brazier, triple winning, type 4 powered 1303 that he took in part exchange for his Rally Beetle and has been in son Liam's hands for the last year. It was nice to get "Re-Start" before Christmas and Pat's piece sent me scurrying for my Clee Hills regs to find - yes I had missed the fact that Simon Woodall and Barbera Selkirk will be running the event this year. Like many organisers Jonathan and Pat have taken on more and more and finally they needed to drop something. It's good that Simon and Barbera were able to step back in the Clee Hill's chair as it is a very good event and it would have been a shame to loose it.